Pipe inspection can be a dirty, sometimes thankless job. It can be dark, hot, uncomfortable, difficult to move, and just plain dangerous. According to propublica.com, a gas pipeline explosion in San Bruno, California rose to as much as 300 feet in the air. The residents said the explosion was so large they thought an airplane had crashed. In a post 9-11 world, this would have been terrifying to all involved. Of course, no one would have been inspecting this particular pipe when the explosion happened, but it does point out how dangerous pipes can be overall. A quick online search using the keyword “pipe inspector jobs” brought back 192 results alone on a job website. So as dangerous as pipe inspection can be, folks are hiring inspectors while others are willing to take the job. There is a huge push in America to make jobs like pipe inspection inherently safer. Pipe inspection robots are one way to make sure that workers stay safe, while the job still gets done. Pipe inspection robot advantages are easily understood. Pipe inspection robots are able to do the most tedious, and perhaps dangerous part of the job, saving the human workers to only apply the fix once the problem is found. The longer a pipe inspector is down inside a pipe either inspecting it for trouble, or trying to find a known issue, the more chance they can fall prey to a dangerous situation. The pipe inspection robot advantages are best used in a situation just like this! A pipe inspection robot can inspect for long durations at a time while leaving the human inspectors above ground to monitor its actions. Then once the problem is found, the human workers can get in and complete the repair. Much like any other dangerous job, the danger is reduced the less time a human worker is actually in the danger zone. For this reason, many pipe inspection companies are relying more often on pipe inspection robots and the advantages they bring to make the job safer and more efficient. SuperDroid Robots of North Carolina are at the forefront of technology when it comes to pipe inspection robots and inspection robots of all kinds. They know that keeping humans safe is the most important thing to bear in mind when it comes to dangerous jobs. They had already proven their skill at maintaining safety with their incredible line of tactical robots for police, military and first responders, so inspection robots were a natural next step. The workhorse of their inspection line of robots is the SJ-32-W Treaded Waterproof Pipe and Duct Inspection Robot. It can easily fit in any pipe with an inner diameter of 10 inches or more. Since it’s a treaded robot, it can navigate over obstacles that many inferior robots would succumb to. When others are turning back, this robot is just getting started. It comes with a full pan-and-tilt camera which is protected with a clear dome to keep it from getting damaged during the job. The camera has 10X optical zoom so you can inspect even farther away from where the robot can get to. A second, fixed rear camera is also installed on the robot so that the tether can be monitored when backing out of a pipe. For longer tethers, a tether spool is also an option. This makes it much easier to retrieve the pipe inspection robot once the job is done. This inspection robot is smaller than you might think, which for pipe inspection jobs, is a good thing! It stands at 8.5″ wide 17″ long and 6.5″ high, so it can fit in places much smaller than any human can. It has a run time of up to three hours under normal conditions, which gives you plenty of time to inspect, find the problem, and complete the job. Dirty dangerous jobs aren’t going anywhere, but technology can come to the rescue in many cases. Pipe inspection robot advantages are one way of making at least one type of job safer for the human workers involved. 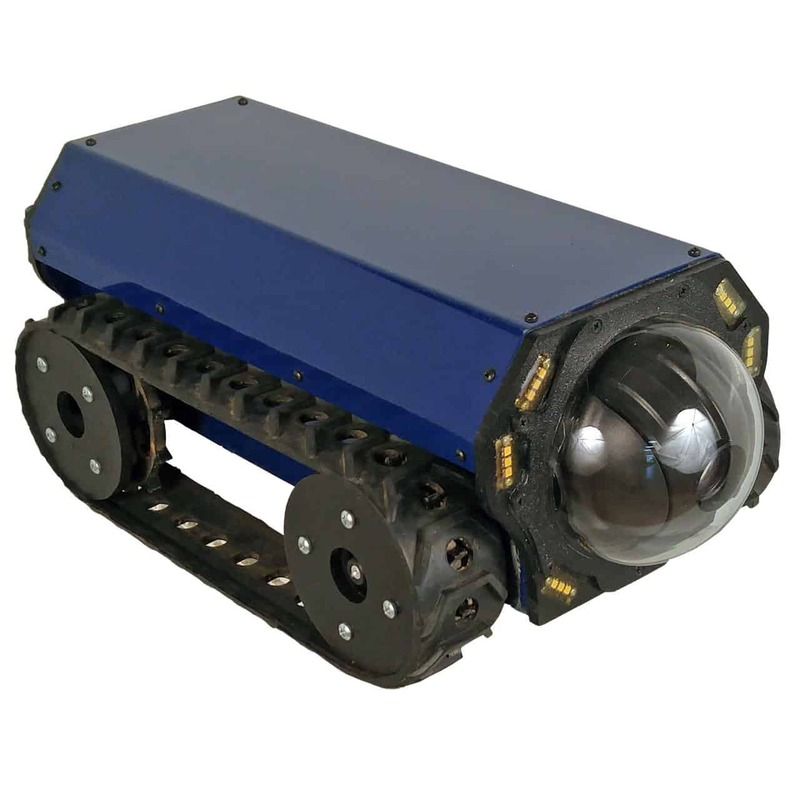 Check out the SuperDroid Robots online store to find out about the SJT-32-W Treaded Waterproof Pipe and Duct Inspection Robot as well as their entire line of inspection robots. In most cases, it is difficult for inspectors to directly inspect the extent of contamination and damage to the internal surfaces of small diameter pipes, as access to the inside of these pipes is limited due to size of devices and associated in-pipe environmental conditions.